It is all too easy to fall into the trap of thinking that trading profitably, whether in equities, indexes, futures, Foreign Exchange, options or any other instruments cannot be difficult. After all, you might think, prices can only go up or down and, so long as you can predict the direction correctly more times than you get it wrong, you will be OK. It does not work like that. For one thing, no matter how carefully you choose you broker (and it is important to choose him carefully), there are costs involved in trading, whether you win or lose. For this reason a simple majority of winning trades is not enough. For another thing, there is a deep psychological aspect to trading, which really must be experienced to be appreciated. And then you have to deal with the reality that successful trading means being profitable all the time, month in and month out. This requires constant care and attention, and a deep self-awareness. It is also easy to fall into the trap of believing that when you are out of the market for what seems like a long time there is something wrong, despite the fact that the market has been in a flat period and there is nothing to be got from it, only a higher probability of losses. This is group-think at its very worst, when you should and must be able to think for yourself. To trade, you must understand your motivation. Do you see your buying and selling activity as a business, which will pay your mortgage and all other expenses reliably into the future? Or do you see it as a game, where the thrill of the chase and the adrenaline rush of a big win are more important even than the amounts of money involved. Or do you fall into some intermediate position in the spectrum between these extremes? One thing is for sure, there are no quick fixes. There is no magic bullet. There is no robot that can come even close to fulfilling the requirements of consistent, replicable, profitable trading. You must strive from the start to gain a deep understanding of all aspects of trading, and then you must carefully apply what you have learned, on a continuous basis. This means knowing and understanding the part played by the fundamental events that move tradable instruments, it means being familiar with the Technical Analysis of charts if for no other reason than that all, or nearly all, of the traders with whom you will be competing pay close attention to this subject. And it means being in a position to use Algorithmic Trading software routines to assist you in placing and managing trades so that they are placed efficiently and managed effectively to lock in profits and preserve your equity. In short, there is no honour in attempting to trade without giving yourself every conceivable advantage. 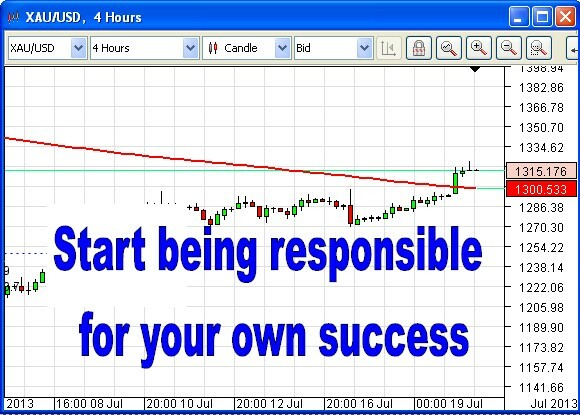 Remember that once you lose your equity, or even a substantial proportion of it, you are out of trading. The psychological mountain that must be climbed to come back from a position where you have lost half your stake makes the North Face of the Eiger look like a garden path. Self-awareness, mentioned above, is about knowing for yourself what must be done at any given time. This could, for example, mean being out of the market altogether for extended periods. Well-structured teaching is necessary to lead you along the way and to suggest actions (or inaction) from time to time, but the goal has to be the to gain the ability to leave the comfort of this particular nest and learn to make these decisions for yourself, without hesitation.